As a Lucio main, I enjoy offclassing Soldier 76 because he retains (admittedly far less impressive) mobility and healing-focused abilities, letting me actually kill people while still filling a secondary role doing what I love best. And over time, thanks to my mobility addiction, I’ve found myself comboing the pieces of his kit in unusual ways to make my way around the battlefield. Because of the minor self-knockback on Helix rockets and the way Blizzard coded his sprint, Soldier 76 has the capability to reach some unusual places with what the community has dubbed “helix jumping”. But before we get into helix jumping, you need to know about the easier (and extremely useful) sprint jump. Soldier 76’s sprint ability increases his forward momentum and can be activated at any time, including while he’s airborne. 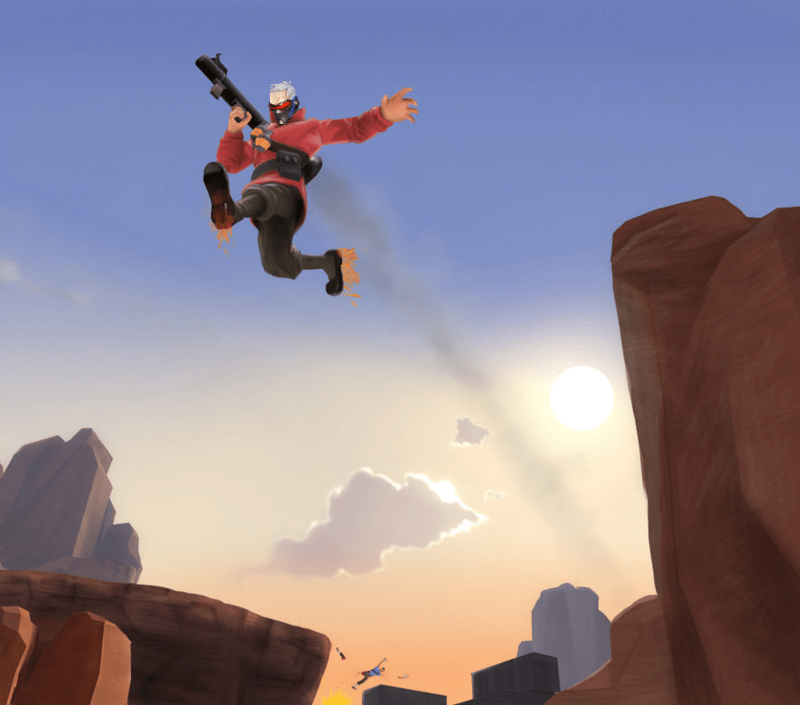 This means that in defiance of modern physics, Soldier can start sprinting in midair and magically travel further before landing. This opens up a number of possibilities that can’t be done with a typical jump, and even for regular gameplay there’s often no downside to using a sprint jump so it’s a good habit to pick up. The helix jump itself is slightly more situational since it’ll damage you and set your rockets on cooldown, but if you shoot your feet immediately after jumping you can gain some pretty impressive air. If you combo this with the aerial sprint mechanic, you can gain enough horizontal momentum to land soldier in some unexpected places. One thing you’ll start noticing as you do these is that Soldier can’t fire rockets while sprinting, so if trying to sprint-helix jump your timing has to be super precise. You’ve basically got to jump and helix at the same time, but hit your jump key ‘first’, and then start sprinting at the highest point of the jump so you don’t cancel the helix animation. A helix jump will deal 40 damage to the player, so make sure you’ve got the health and, if needed, use your biotic field to patch yourself up afterwards. Though at that point, you’ve reset every single one of your abilities for a single jump, so it’s not the sort of thing you should need to do all the time. But it’s still an important mechanic for any Soldier 76 player to know how to do because of the flanking routes and high grounds it can unlock. There are loads of YouTube videos showcasing dozens of useful helix jumps on every single map, I highly recommend any Soldier 76 player go check them out. Though I must warn you, much as I did Genji mains in my last article on a mobility exploit, Blizzard doesn’t have the greatest track record letting these sorts of community tricks go unpatched. There’s a very real chance this combo will be removed from the game for falling outside Blizzard’s intended purview for the character, so enjoy it while it lasts.